← 10/25/2013 – More POWER!!!! We made a couple of minor changes as a result of our trip to the States that have resulted in an improved quality of life aboard Siempre Sabado. Things have always been a wee bit dark and cave-like down below thanks to inadequate lighting. The original lighting was all incandescent and used very inefficient automobile tail-light bulbs. These were borderline bright enough but used way too much of our precious battery power. I eventually changed most of the bulbs to LED but continued to use the original fixtures. The brightness of the LEDs was largely dependent on when (meaning the year) we bought them. The first ones seemed pretty bright but cost a ridiculous amount of money. As time went by LEDs got brighter and cheaper but, since they’re designed to last just about forever, it was hard to replace the old ones that were still working. However, the difficulty in seeing things down below finally got the better of my cheap-osity and we decided to spring for new fixtures. I’d always read really good things about the Alpenglow line of lights but had always been put off by their price which seemed a wee bit dear to me. However, if we were going to put out substantial money for lights it would be nice to be able to see when we were done and also to have lights with a good reputation rather than something cheaper that may end up breaking. 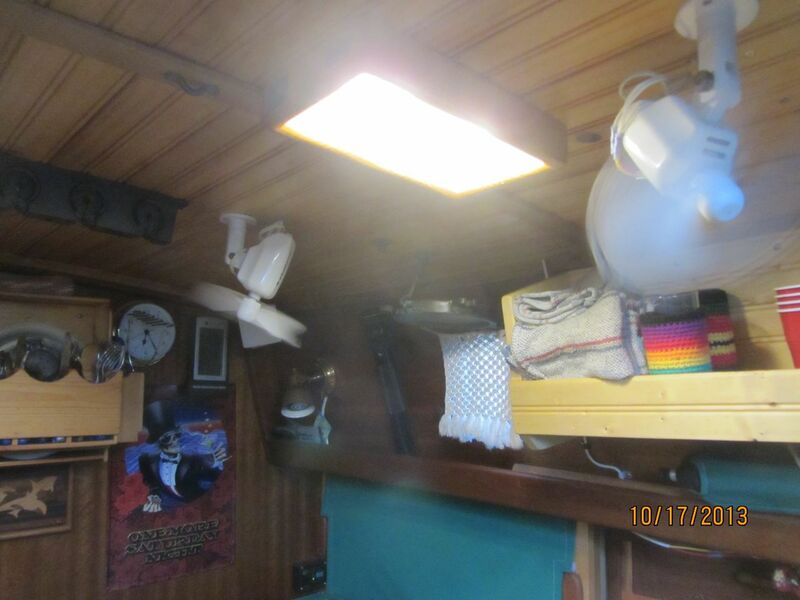 I was particularly attracted to their line of 9-watt LED dual-power lights with night vision. The light has a low power and high power main light as well as a dual power red light for nighttime. I bit down hard on the bullet and placed an order for three of them. The pain of the initial purchase price has passed and we are now basking in the soft glow of our new lights that are actually bright enough that we seldom use the high power setting. This one’s over the table. We have another over the stove/sink, about 4′ away. We can definitely see what we’re doing now. Underway, it’s best to use red lights to maintain night vision when going below for something. 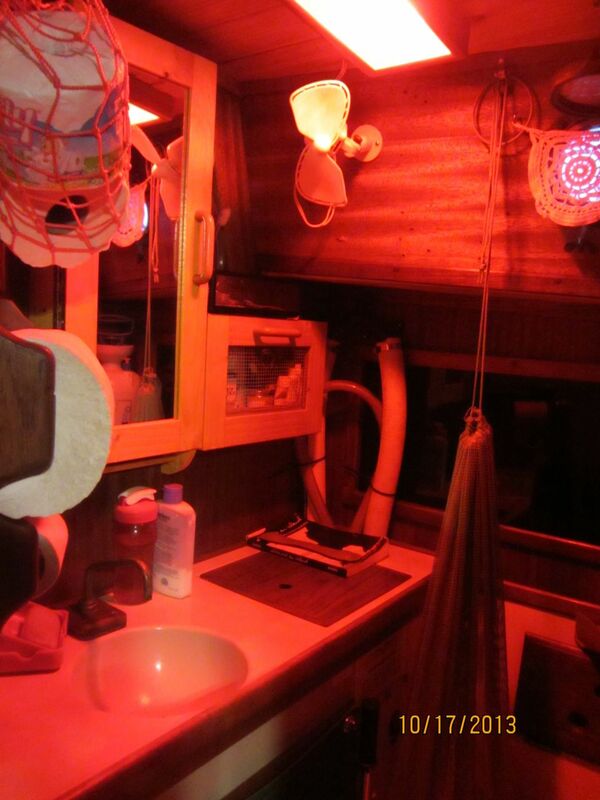 We had one red light over the nav desk before but it was pretty anemic. 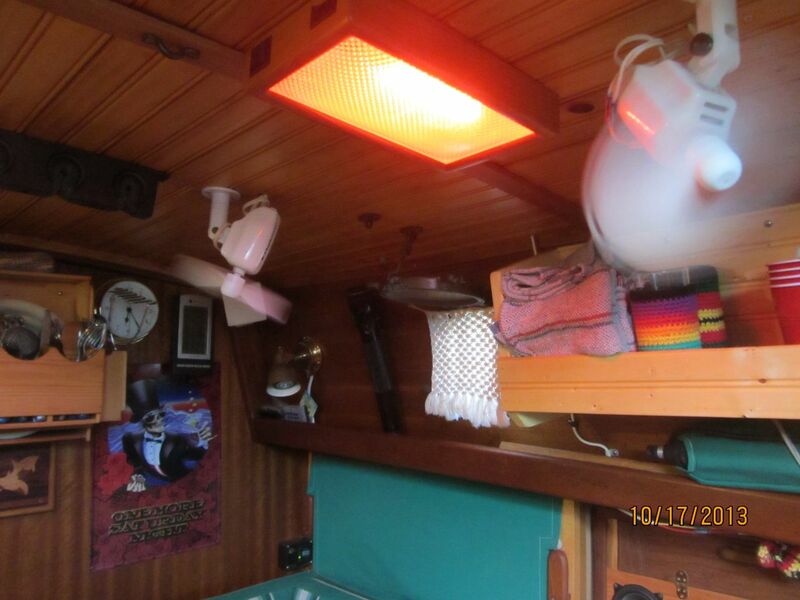 Now we have two dual-power red lights in the main cabin as well as another in the head. Low beam red – Just right for those middle of the night visits when you just woke up. On the downside, we can now clearly see all of our flaws. Another minor improvement involves dishwashing or, more accurately, dish drying. 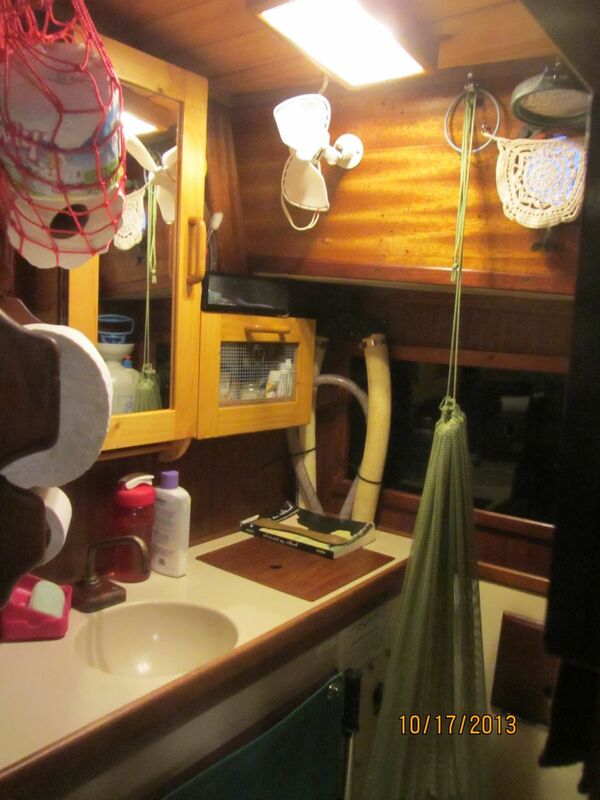 When we’re not underway, we tend to let dishes air-dry as they seem to end up a lot dryer than when we towel-dry them. Hurting for counter space, we put a cutting board on top of the stove, spread out a towel and then get really creative about piling dishes up. 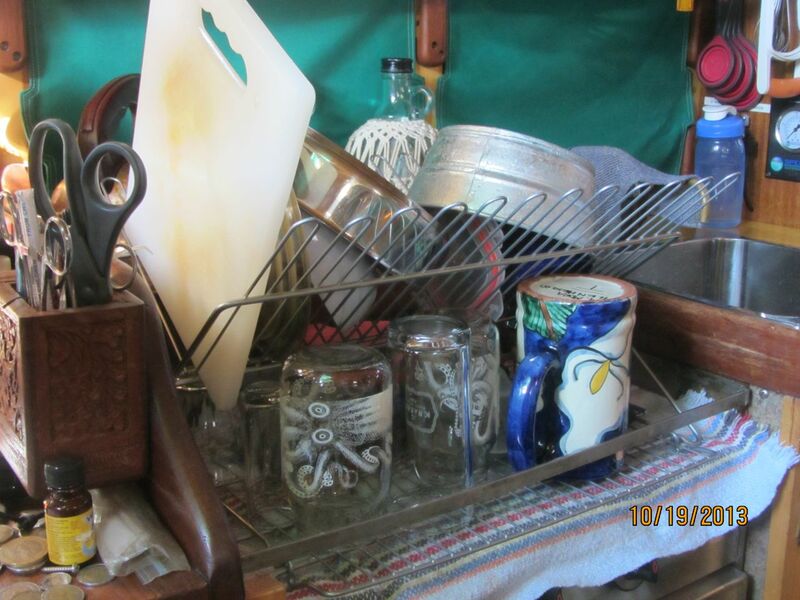 This works OK but it would be nice to be able to pile more dishes up and still maintain some free airflow around them. 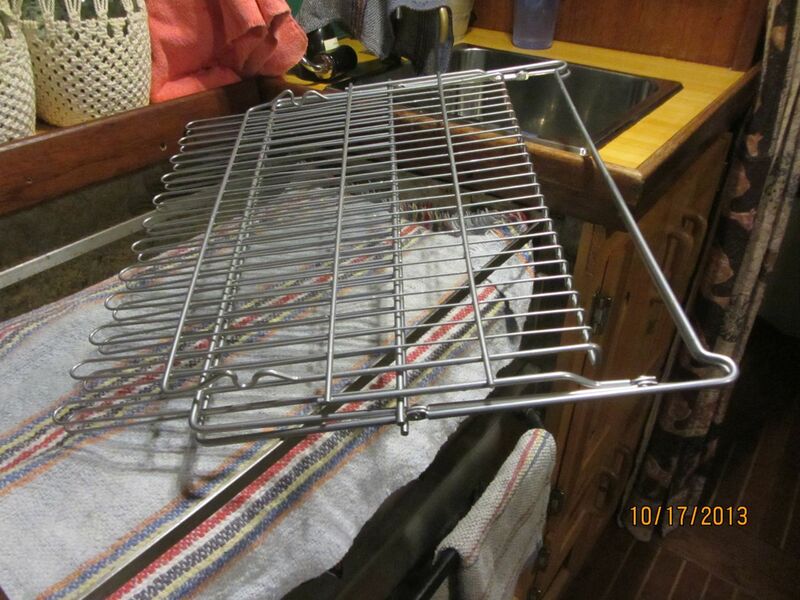 We’ve seen and used various folding drying racks over the years, mostly in our campers but none of them really filled the bill. They never seem to deliver the goods in that they don’t actually hold very many dishes. 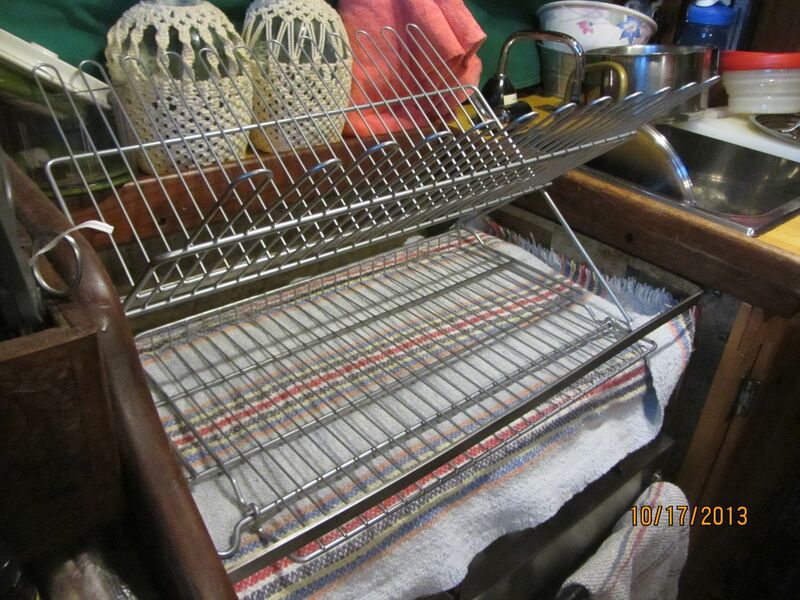 Before we headed north this year, I scoured the internet looking for some sort of rack that might actually satisfy us. I think we’ve found it although, sad to say, I don’t remember where I actually ordered it from. When unfolded, it presents a lot of drying/stacking space on a very stable platform. And, you can really stack the stuff up. In this photo we haven’t even begun to use all the space available. For instance, all those fingers along the top can hold glasses and cups. 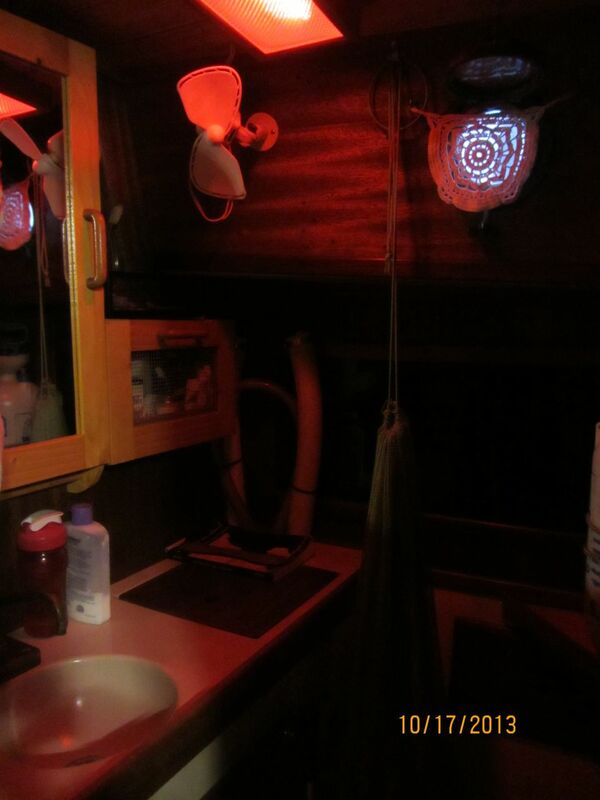 I realize that writing about items like lights and dish racks is pretty freakin’ mundane but these are the kinds of little things that make life on a tiny little boat bearable. Steve – Just for comparison you’ve seen our boat and we run everything including the water maker with just 210 watts of solar. We’re rarely down more than 10% (45 amps), fully charged almost everyday and didn’t even carry a Honda generator. Going to LED was a major improvement. We’re liking the Dolphin idea more each day. We’re about two weeks from heading south. Good to know, Jim. Do you guys also run a refrigerator? Our biggest energy hogs are the fridge, the watermaker, and the inverter to recharge computers. And, of course, we run our Caframo fans pretty much round the clock during the summer, which, as you know, is at least 6 months of the year. Yes we run a 5 cu. ft. refrigerator but without a freezer. That would had added another 6-8 amps on the daily load which would have been manageable but we felt we needed the refrigerator space more. We have a very efficient system with a vacuum panel box from Glacier bay. Unfortunately they are no longer in business. We also have a Spectra Catalina and run the computer on a small pocket inverters, which is a little more efficient than a large inverter. The biggest advantage is our panels are fully adjustable, which can triple the daily output. Everyone knows panels work best in direct sunlight. But what is not considered is that we can get near full output at 9 a.m., instead of waiting until noon. On top of that Julie calls me an amp Nazi! It was really great seeing you guys in Stockton, that was a real treat. Thanks Sandy. Sometimes I write these things and later on think, “OMG! Why would anyone care how we dry our dishes?” Nice to know that someone does. Also, this blog is not just for others. It also serves as our journal. I can’t count the number of times we’ve referred back to it to find out when we did this or where we bought that or where we were when such and such happened. Steve – thanks for posting these things. It is all great information for us as we are preparing to cruise in a couple years.